This 40 years, it is my first time to recall back my past turbulence and my family. I was born at an architectural still house in the heart of Siem Reap in 1976, one year after the ascending to power of the Khmer Rouge. I am recalled by mother since I was very young on many things that I am having difficulty to remember. I have remembered clearly only my birthday I was frequently asked to recite it in Khmer traditional lunar calendar. My father passed away since I was in the womb. I have never seen the face of my father even though through the photo. Mother told that all family pictures and photos were totally destroyed to avoid catching up as enemy and facing death penalty. My mother passed away when I was 11 years old. The bitter story has later little been told by my survival two older sisters. All my four siblings were killed during the regime. I have no clue tills today that how could I pen about them or figure out about their face accurately? During the Khmer Rouge period, I have no memory at all except some flashing image occurring within my head on how bad I was crying inside the Buddhist worshiping hall to ask for mom and to scavenge for food to eat. But I remembered the starvation and famine during the presence of Vietnamese solders patrolling surround my house in Phum Dang-het, Srok Chi Kraeng. I think during 1979 to 1980, there was famine throughout the country. In commemoration of 40 years when the Khmer Rouge came to power to lead a country of extremism and jungle leadership. Botta, the high commissioner for youth and sports, stands at the end of a row of suited men, arms behind his back, staring defiantly into the camera. Lon Nol, the mystic “Marshal” that led the ill-fated and highly corrupt republic, stands in the middle, leaning on his cane but still towering over the rest. “Most of them were killed by the Khmer Rouge,” Botta, now 72 and an opposition MP, says. It has been exactly forty years since the Khmer Rouge marched into Phnom Penh on April 17, 1975. The stories I have heard since I was a young child continue haunt me, and the bits and pieces of the puzzle never quite formed a solid picture of what really happened. Forty years later, the story of my family’s experience was still a mystery to me. While other stories from survivors were clear in my mind, I never heard the entire story from my parents, until now. Perhaps it was my frequent visits home, with cohorts of inquisitive graduate students that prompted me to ask, in detail, the story I had wanted to hear. It was never a question that surfaced in my mind as one that should be asked. As a child of genocide survivors, it was something I feared, something I ignored. Yet, the more students I brought to Cambodia, the more their questions made me realize that the genocide was something that needed to be told. My family’s story was not something to be ignored, but rather something to be acknowledged, both for the survivors themselves and for their children. And so begins the story of one family, who much like the rest of the Khmer people, faced tragedy and immeasurable sorrow, and somehow found a way to survive. Sophal Ear, SEARAC Board Member, Occidental College Professor of Diplomacy & World Affairs, and TED Fellow, tells the compelling story of his family’s escape from Cambodia under the rule of the Khmer Rouge. He recounts his mother’s cunning and determination to save her children in his 2009 TED Talk, “Escaping the Khmer Rouge.” His mother passed away six months later. On April 17, 1975 — 40 years ago today — life as Ly knew it was shattered when her hometown, the Cambodian capital of Phnom Penh, fell to the genocidal Khmer Rouge regime of the Communist Party of Kampuchea. Ly, then 13, was separated from her mother and two of her sisters who, along with virtually the entire population of Phnom Penh — about two million people — were sent on a forced march into the countryside to work. Ly never saw them again, nor learned what happened to them. But about 20,000 people died from execution, starvation or exhaustion during this exodus at gunpoint, according to war crimes prosecutors; the others were subjected to slave labor in rural camps once they reached their destination, where many met similar fates. “The children’s arrival was not all smooth and happy,” recalls Gaffar Peang-Meth, who became the point man for verifying many of their legal status. 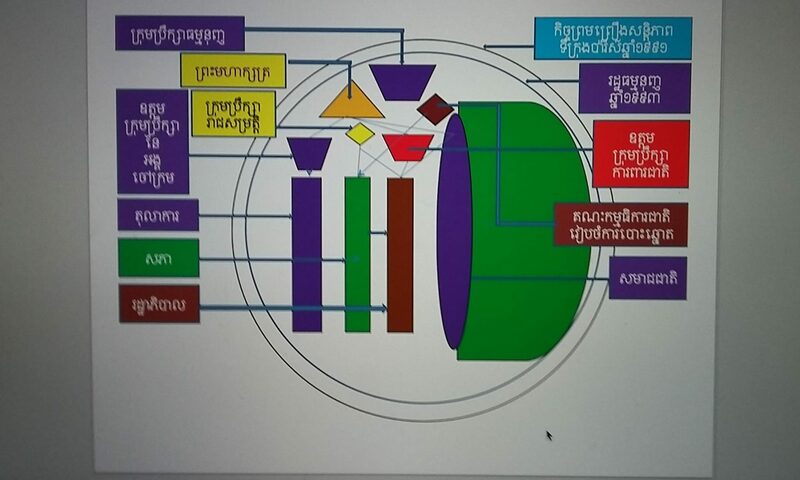 Some news media reports suggested that the children were not all orphans and openly questioned why they had been brought to the U.S. Gaffar Peang-Meth responded that there was no authority in Phnom Penh to answer such allegations. A few hundred people, including monks and elderly regime survivors, gathered early Friday at Choeung Ek, the most notorious of the regime’s “killing fields” on the capital’s outskirts, burning incense and saying Buddhist prayers at a memorial stupa housing the skulls and bones of victims. 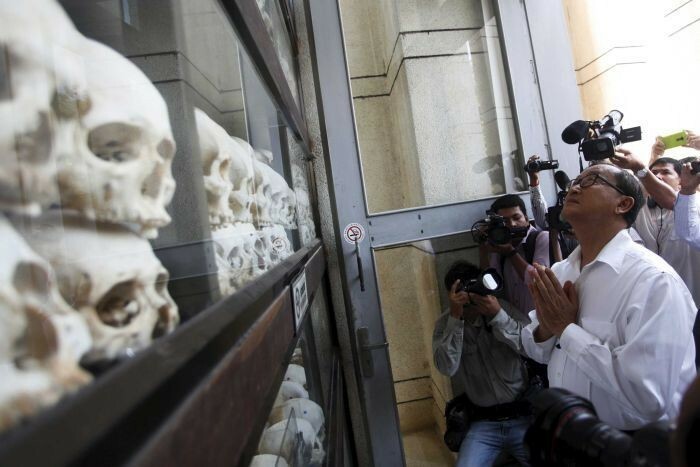 Cambodia’s opposition leader, Sam Rainsy, led prayers at the former killing fields. He reminded Cambodians of the importance of the ongoing trials of surviving Khmer Rouge leaders. “It is why every year we remind the people in power to support the Khmer Rouge tribunal,” he said. Friday marks 40 years since the Khmer Rouge first marched into Phnom Penh. Over the following 44 months in the region of 2 million people from a population of just over 8 million died – killed, starved or struck down by disease – as Pol Pot’s brutal regime attempted to style Cambodia into a classless, agrarian society. Cambodia is still struggling to deal with its history, where personal memory is politicised and the spectre of the Khmer Rouge is ever-present but often wilfully ignored. Even the most basic term remains contentious: can a regime be described as genocidal when so much of the killing of Khmers was done by Khmers? Nhem En, a survivor of sorts from that dark time, is an unwelcome reminder of a knot of dilemmas that Cambodia is only starting to untangle – who to blame; how to forgive; and how to understand a regime that implicated such large swaths of the population in seemingly unfathomable cruelty.